China’s Premier, Wen Jiabao, continued his British visit and promised that he would take measures to increase trade between Britain and China, in particular he offered to whip the Chinese into a frenzy to buy something, anything, British. China, soon to become the leading economy in the world, is thought to be sitting on cash reserves of $3trillion that it wants to diversify and use as investment. 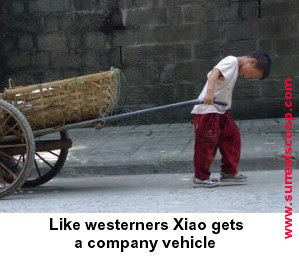 With workers in western economies increasingly under pressure from cheap off-shore labour, the Chinese are said to be very keen on encouraging a business model similar to that of the newly re-launched MG car manufacturer. Mr Wen was introduced to some British shopkeepers as the historic town sweltered under high summer temperatures. Mr Wen was quizzed by reporters on the subject of human rights, a subject many in the west are keen to turn a blind-eye to as long as they can still get a great TV for £500. However Mr Wen said that it was important that China and the UK work closely together to ensure a common understanding of basic freedoms.